Chic on a Shoestring Decorating: Halloween Giveaway! Hi friends! 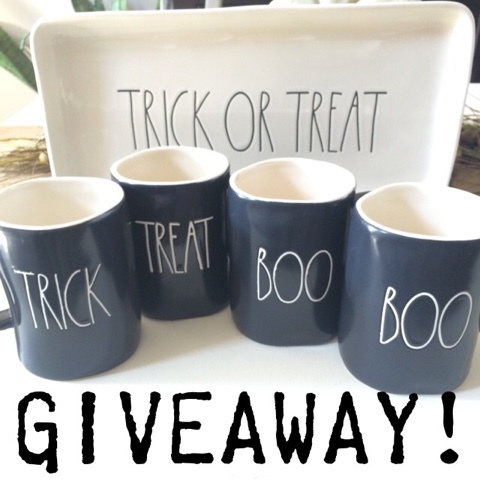 Halloween is quickly approaching so I wanted to do a fun Halloween giveaway! I am just loving these cute coffee mugs and matching dishes I am seeing all over Instagram and the blogosphere. They are a little tricky to find but I luckily came across a few at my local TJ Maxx. I kept a few for myself and I am giving the rest away to one lucky winner! Winner receives 4 coffee mugs and Trick or Treat tray seen above. All you need to do to enter to win is sign-up here for my email list. You'll get an email every time I post a new blog and you'll be the first to get my super-cute free printables that are exclusive to my email list. Please comment below letting me know you signed up. For another easy entry go to my Instagram feed here and comment there.